Radio Adventures of Dr. Floyd EPISODE #302 "The Adventures Of Lewis & Clark!" We meet Lewis and Clark as they reach the Great Falls Of The Missouri River. Meanwhile, Dr. Floyd, Dr. Grant and C.H.I.P.S. decide there is only one answer to the Mr. Beardychins problem. All the while, Dr. Steve and Fidgert are plotting to steal one of Lewis and Clark's compasses. 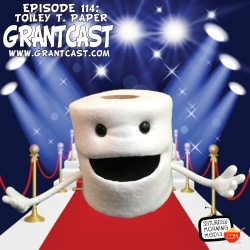 http://www.grantcast.com - In the world of entertainment, they don't come much bigger than Toiley T. Paper! He's done it all: movies, television and even the stage! For this interview we sit down with Toiley to find out about where he came from and his meteoric rise to stardom. Radio Adventures of Dr. Floyd EPISODE #301 "Home Sweet Home!" Dr. Floyd gets a call from his mother who needs a favor while Dr. Steve & Fidgert decide to go pillage the Lewis and Clark Expedition. Mrs. Floyd leaves on a trip to Florida, but puts Dr. Floyd, Dr. Grant and C.H.I.P.S. in an awkward situation.